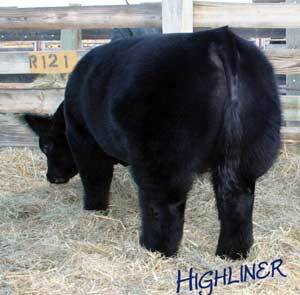 Highliner was described by many of the "well-known" master cattle breeders as the most complete display bull at the 2009 NWSS. He is big footed, extra sound, and huge boned with excellent hair. 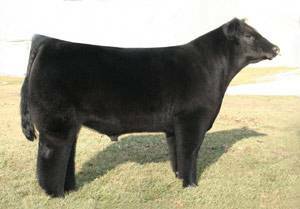 His dam is a full sister to the Grand Champion Hi% Female at the 2004 Maine Jr. Nationals. His unreal backleg is boned to 9" in the photo. Highliner might need to be considered the most exciting all-purpose bull around, considering his maternal pedigree goes back to the famous 224X female. He'll make steers & females!